Soy wax burns cleaner, lasts longer, has excellent fragrance holding qualities and is made using soya beans which are also a renewable source. We don't use colourants or dyes, the only additive is a high quality fragrance oil. Our best selling fragrance by far! Beautiful, sophisticated, elegant and complex in it's blend of fragrance. If we had to choose one fragrance from our range, this would be it. Absolutely stunning.Top notes of Sicilian lime, and zesty bergamot blend into a juicy heart of bursting with ripe mandarins, aquatic white florals, peppery basil and caraway seeds. Base notes include soft velvety patchouli and sharp green vetivert. 100g burn time up to 20 hours. 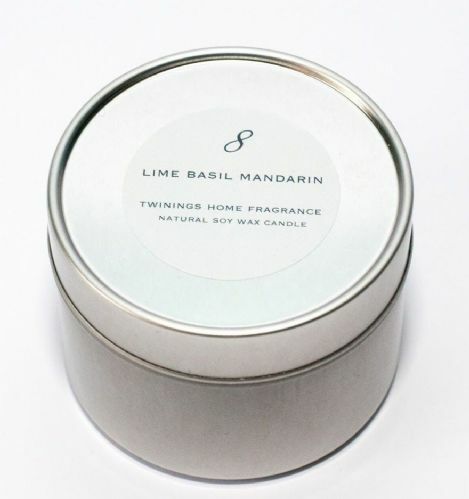 Lime Basil Mandarin scent, refreshing and tantalizing.